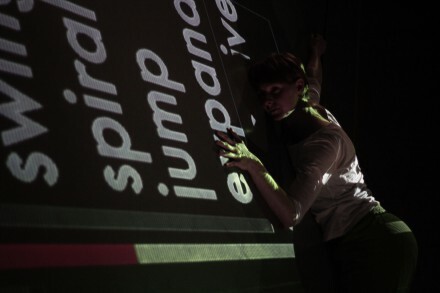 Kate Sicchio and I were recently awarded a European ICT & Art Connect residency to develop ideas involving the combination of choreographic technique with software structuring: how does “thinking in code” influence “thinking in dance”? The result incorporates a Neville Brody-inspired animation system which transforms time-based Clojure DSL data structures into geometric textual designs projected onto the dance floor (and, sporadically, onto our dancer, Tara Baker). We are showing the performance work at FoAM in Brussels on Sunday, and presenting at the European Parliament on Monday.